Imminently, Zero Hedge will present some of its recently percolating theories about some oddly convenient coincidences we have witnessed in the commercial real estate market. However, for now I focus on some additional facts about why the unprecedented economic deterioration and the resulting epic drop in commercial real estate values could result in over $1 trillion in upcoming headaches for financial institutions, investors and the administration. When a month ago I presented some of the projected dynamics of CMBS, a weakness of that analysis was that it did not address the issue in the context of the CRE market's entirety. The fact is that Commercial Mortgage Backed Securities (or securitized conduit financings that gained a lot of favor during the credit bubble peak years for beginners) is at most 25% of the total commercial real estate market, with the bulk of exposure concentrated at banks (50%) and insurance companies' (10%) balance sheets. But regardless what the source of the original credit exposure, whether securitized or whole loans, the core of the problem is the decline in prices of the underlying properties, in many cases as much as 35-50%. 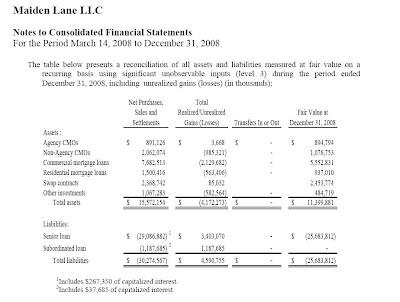 When one considers that with time, the underlying financings became more and more debt prevalent (a good example of the CRE bubble market is the late-2006 purchase of 666 Fifth Avenue by Jared Kushner from Tishman Speyer for $1.8 billion with no equity down), the largest threat to both the CRE market and the bank's balance sheet is the refinancing contingency, as absent yet another major rent/real estate bubble, the value holes at the time of maturity would have to be plugged with equity from existing borrowers (which, despite what the "stress test" may allege, simply does not exist absent a wholesale banking system nationalization). The refinancing problem thus boils down to two concurrent themes: The first is the altogether entire current shut down in debt capital markets for assets, which affects all refinancings equally (for the most immediate impact of this issue see General Growth Properties which was not able to obtain any refinancing clemency on the bulk of its properties). The government is addressing this first theme through all the recently adopted programs that are meant to facilitate general credit flow. Readers of Zero Hedge are aware of our skepticism that these are working in any fashion, especially with regards to lower quality assets. The second theme is the much more serious and less easily resolved issue of the negative equity deficiency on a per loan basis, which is not a systemic credit freeze problem, but an underwater investment problem. This analysis focuses on the second theme. The reason for this focus is that there seems to be an unfortunate misunderstanding in the market that lenders will simply agree to roll the maturities on non-qualifying loans, and that the expected percentage of loans that need special lender treatment is low, roughly 5-10% of total loans. In reality the percentage of underwater loans at maturity is likely to be in the 60-70% range, meaning that refi extensions could not possibly occur without the incurrence of major losses for lenders. In order to demonstrate the seriousness of the problem it is important to first present the magnitude of the refinancing problem. To quote from an earlier post as well as data from Deutsche Bank, and focusing on the CMBS product first, there are approximately $685 billion of commercial mortgages in CMBS maturing between now and 2018, split between $640 billion in fixed-rate and $45 billion in floating rate. The figure below demonstrates the maturity profile by origination vintage. As noted previously, vintages originated in the pre-2005 bubble years are likely much less "threatening" as even with the recent drop in commercial real estate values, the loans are still mostly "in the money". As Zero Hedge has pointed out previously, the biggest CMBS refi threat occurs in the 2010-2013 period when 2005-2007 vintaged loans mature. These loans, originated at the top of the market, of which the Kushner loan for 666 Fifth Avenue is a brilliantly vivid example, have experienced 40-50% declines in underlying collateral values, and the majority will have material negative equity at maturity (if they don't in fact default long before their scheduled maturity). Of these loans, only a small percentage will qualify for refinancing at maturity. At this point cynical readers may say: well even if all CMBS loans are unable to be rolled, it is at most $700 billion in incremental defaults. Is that a big deal - after all that's what the government prints in crisp, brand new, sequentially-numbered dollar bills every 24 hours (give or take). Well, the truth is that CMBS is only the proverbial tip of the $3.4 trillion CRE iceberg. To get a true sense for the problem's magnitude one has to consider the banks and life insurance companies, which have approximately $1.7 trillion and roughly $300 billion in commercial loan exposure. Banks have $1.1 trillion in core commercial real estate loans on their books according to the FDIC, another $590 billion in construction loans, $205 billion in multifamily loans and $63 billion in farm loans. The precise maturity schedule for these loans is not definitive, however bank loans tend to have short-term durations, and the assumption is that all will mature by 2013, exhibiting moderate increases in maturities due to activity pick up over the last 2-3 years. Adding the life insurance company estimate of $222 billion in direct loans maturing through 2018 per the Mortgage Bankers Association, increases annual maturities by another $15-25 billion. In summation as presented below, the total maturities by 2018 are just under $2 trillion, with $1.4 trillion maturing through 2013. Combining all sources of CRE asset holdings demonstrates the true magnitude of this problem. The period of 2010-2013 will be one of unprecedented stress in the CRE market, and a time in which banks will continue taking massive losses not only on residential mortgage portfolios but also on construction loan portfolios, the last one being a possible powder keg: Foresight Analytics estimates C&L loan losses at a staggering 11.4% in Q4 2008. 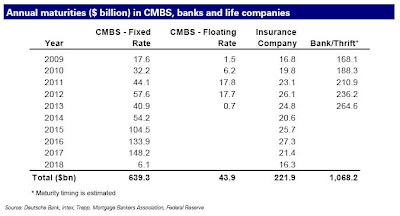 And the bad news continues: there is a risk that commercial mortgages will under-perform CMBS loans, and delinquency rates for bank commercial mortgages will be magnitudes higher than those for comparable CMBS. The figure below demonstrates the undperformance of bank commercial mortgages: as of Q4 2008 the delinquency rate for CMBS was less than half of bank CRE exposure. Reflecting on this data should demonstrate why the administration is in such full-throttle mode to not only reincarnate credit markets at all costs (equity market aberrations be damned) but to boost credit to prior peak levels, explaining the facility in providing taxpayer leverage to private investors who would buy these loans ahead of, and at maturity. Absent an onslaught of new capital, there is simply nowhere that new financing for commercial real estate would come from and the entire banking system would crash once the potential $1 trillion + hole over the next 4 years become apparent, as there is less and less capital left to fill the ever increasing CRE cash black hole. An attempt to estimate the number of loans that would not conform for refinancing, based on two key criteria of cash flow and collateral presents the conclusion that roughly 68% of the loans maturing in 2009 and thereafter would not qualify. The amount of refinanceable loans is important because borrowers will either be unwilling or unable to put additional equity into these properties. Instead borrowers will be faced with either negotiating maturity extensions from lenders or simply walking away from properties. And despite the banks' and the administration's promise to the contrary, loan extensions will not provide the way out (see below), meaning losses taken against CRE is only a matter of time. For the purposes of the refi qualification analysis, the criteria that have to be met by an existing loan include a maximum LTV of 70 (higher than current maxima around 60-65), and a 1.3x Debt To Service Coverage Ratio (equivalent to a 10 year fixed rate loan with a 25 year amortization schedule and an 8% mortgage rate). The simple observation is that nearly 68% of loans in the next 4 years will not qualify for a refinancing at maturity putting the whole plan to merely delay the day of reckoning indefinitely at risk of massive failure. The underlying premise of maturity extension as a solution to a loan's qualifying problem is that during the extension period the lender is either able to increase the amortization on the loan by some means (i.e. increasing the interest rate and using the extra cash flow to accelerate the loan's pay down), or achieve value growth sufficient to allow the loan to qualify by the end of the extension period. As the equity deficiency for many loans is far too large to be tackled by accelerating the amortization over any period of time, and as for "value growth", with hundreds of billions in distressed mortgage building up over time via these same extensions (even if successful), the likelihood of property price appreciation is laughable: the flood of excess supply of distressed mortgage to hit the market is about to be unleashed. Then there is the logical aspect: maturity extensions merely delay the resolution and push the problem down the road. And as for CMBS, the issue of extension may be dead on arrival - not only are CMBS special servicers limited to granting at most two to four year maturity extensions, but AAA investors are already mobilizing to stanch any more widespread extensions as a means of dealing with the refi problem. And, at last, there is the view that the refi problem could fix itself, based on the argument that CRE cash flows are likely to rebound quickly as the economy begins to improve due to pent-up demand. This argument is nonsense: even if cash flows recover to their peak 2007 levels, values would still be down 30% as a result of the shift in financing terms. Ironically, it would require cash flows rebounding far beyond their peak levels to push values up sufficiently to overcome the steep declines. This is equivalent to predicting (as the administration is implicity doing) that the market will be saved by the next rent and real estate bubble, which the U.S. government is currently attempting to generate. In this light, anything that the government can try to do, absent continuing to print massive amounts of dollars, is irrelevant. The equity market can easily go up indefinitely, short squeezes can be generated at will, TALF can see 10 new, increasingly more meaningless permutations, the administration can prepare worthless stress tests that are neither stressing nor testing, and talk up a storm on cable TV to convince regular investors that all is well, yet none of these will do one thing to provide the banks and CMBS borrowers with the massive capital they will need to plug the value gap either during a CRE loan's term or at maturity. The multi-trillion problem is simply too massive to be manipulated and is also too large to be simply swept under the carpet for the next administration and generation. It is inevitable that the monster hiding in the closet will have to be addressed head on, and the sooner it happens, the less the eventual destruction of individual and societal net worth (however, it still would be massive). Delaying the inevitable at this point is not a viable option: Zero Hedge hopes the administration realizes this, ironically, before it is too late. Among the more important facts skipped by the general public in its fascination with the equity bear market rally, is that the perspective for leveraged corporate issuers is getting worse and worse, never more so than just this March, when the monthly annualized default rate surged to a 20 year record high of 19.4%, on par with rating agency expectations for 2009 actual default rates. This has been coupled with unprecedented low unsecured recovery rates of 9%. Yet these two facts have not prevented the high yield cash market to post NASDAQ like YTD returns. In this sense, the HY market is merely another example of an asset class becoming completely unhinged from its news flow and fundamentals: that in itself is not surprising - most assets lately are trading on deferred hope and good intentions than actual facts. We think the explanation is partly fundamental, and partly technical. First, as we argued last week, tentative signs of stabilization in macro data suggest that the recession is near a bottom. As the tail risk of an even deeper recession recedes – and we agree that is has – credit spreads should rally, especially HY. But we also suspect a strong technical component because money flows are high and liquidity is low. Since Dec. 1, 2008, retail investors have allocated over $8 billion of net new money to HY mutual funds. And finally, we think these bullish forces have been magnified by the fact that most investors were underinvested in the market. This presumably damped selling pressure as bond investors felt compelled to cover their “short position” in cash. Economic growth is still deeply negative, which translates into very negative cash flows. As banks and insurance companies digest continuing losses amid heightened regulatory pressure to raise new capital, we expect credit supply to remain relatively tight. As earlier pointed out, another unique feature of the current "D-process" is that recovery rates on unsecured defaults are less than half of what prior recessions have demonstrated. While in prior downcycles recovery rates have averaged about 20%, empirical data since December 1 shows an average unsecured rate of 9%. And the trends is only getting more acute: the last four CDS settlement auctions that have taken place over the past 2 weeks have averaged less than 6%, as seen by Chemtura's 15%, Abitibi's 3.25%, Chater's 2.375% and Idearc's 1.75 recoveries! Another troubling data point is that secured recovery rates, as demonstrated by LCDX auctions, demonstrate an almost statistically insignificant difference from unsecured recoveries at 15.4%. An interesting side-phenomenon is that bankruptcies are becoming the true Litmus test of the current economic fiasco. Once the "hope" element is removed from asset pricing, the real lack of clothing become imminently apparent. Nowhere is this more evident than in Lehman's unsecured recovery rate, as Zero Hedge has discussed previously. With Lehman's unsecured bonds clearing at a 8.625% recovery rate, one can only speculate what is the true worth of the other financial institutions if they were to be seen in the same perspective as Lehman. After all the 8.625% recovery rate (which, of course, implies there is over 91% of value deficiency to the equity tranche), if even haircut by a generous 50%, implies that banks who hold comparable assets to Lehman (most of them) are impaired beyond repair. The conclusion is that while Lehman is trading purely on run-off or liquidation value, there is some magical "hand" that is allowing the other banks to trade at exponential multiples of value compared to real, market tested run off asset value. If one does a back of the envelope analysis for Citi, BofA and Wells Fargo, and projects asset values based on Lehman unsecured obligations' trading price, the equity value in each and every one of the abovementioned banks is staggeringly negative. One last thing to point out, is that while pure cash HY bonds have benefited from the same old technical aberrations, the same can not be said of the synthetic market, best seen in the performance of the HY11 index. 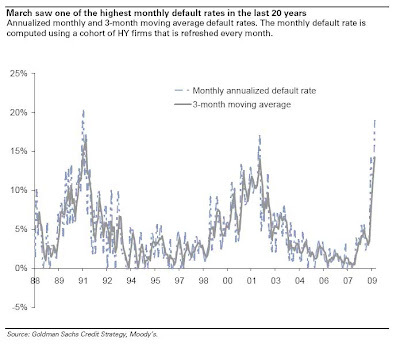 Unlike standalone credits, defaults have a direct impact in the pricing, and thus value, of this index. The chart below demonstrates that HY11 is down 8% for the year, and the bulk of this underperformance is due to default losses on 6 names! These have more than offset the positive carry and mark-to-giddy-market gains. It is only a matter of time before cash fundamentals on single names revert back to some form of rationality and retrace a substantial portion of the undeserved MTGM gains year to date. More than 150 means at least 151. Is the US Iceland or something? Ten trillion dollars in assets and five hundred trillion dollars in derivatives in one month? A typical single bank examination utilizes hundreds of examiners and takes several months. Clearly the next release of public sector productivity numbers is going to astonish. In other words, the banks tested themselves and the 150 examiners took their word for it. Any wonder they passed? Well, it used to be. Now that job has been outsourced to the US Taxpayer. (4) “As a result of the loss recognition framework for assets in the accrual loan book, the results of this exercise are not comparable with those that would evaluate such assets on a mark-to-market basis”. Absolutely. What does the market know anyway? The banks’ models got us into this calamity so damn if they can’t get us out! Apparently Treasury is absolutely certain that the crisis they never saw coming will be over soon and in no way is today like 1930. Great news! Again, Treasury outsourced the testing to the banks themselves. So what was the job of the Treasury staff other than to photocopy , collate and file? Was this a Temp Staff? Kelly Girls? I know it looks bad, but believe me, it’s getting better! Under the baseline case the economy stops its downward acceleration in Q3 2009. In the so-called adverse case this occurs in…Q3 2009. Best case is an additional 17% fall from Dec 2008, worst is 27%. The Treasury tripped over itself here, as WFC and BAC have massive mortgage portfolios in states like CA where prices are already off 45% and the banks have only provisioned for, at most, 30%. Guess we can go back to Point 7 to whitewash this inconvenience. I know there are some modelers out there. How does one reasonably construct a regression analysis on past data when nothing similar has ever happened? Ah…smells like Gaussian distributions. The old standard. We have seen how well that assumption works in these unusual times. An example of the dependability of using Gauss, taken from stock market movements in October, and calculated by Nassim Nicholas Taleb of Black Swan fame, showed that the price movements seen in October 2008 could be expected to occur---using estimates based on Gaussian distributions---once every 73,000,000,000,000,000,000,000 years. For those of you not tied to Biblical strict constructionism, the Universe is around 18,500,000,000 years old. Looks like it will be a few quintillion years before we see October again. Demonstrating just how massive the ongoing quant (and market) dislocation is, the most recent performance numbers for Jim Simons monster RIEF fund, which is arguably one of the largest quant funds in the world with $100 billion in total capacity (comps being BGI, Getco and Highbridge, the last of which incidentally was responsible for the massive market spike on Thursday afternoon as it force-deleveraged through its owner JP Morgan), indicate that it is underperfoming the S&P by almost 17% Month To Date. One can only imagine what is going on at the internal-only Medallion Fund. The astrophysicists have failed. Hopefully not terminally, although as RIFF is also woefully below its benchmark, these may be dark times for secretive, chainsmoking Jim. As Zero Hedge has warned, when it comes to quant funds, the performance distribution is not a simple zero sum: the market's very topology is held in place by a smoothly functioning quant sector. Its absence results in abnormal and outsized index gyrations, incidentally like the one experienced by the S&P500 in the last 5 minutes of trading on Friday. In an 8-K just released, GM has announced that it has liquidated two key employee benefit plans (the Savings-Stock Purchase Program and the Personal Savings Plan). The plan custodian State Street started selling the plan assets, consisting entirely of GM stock, on March 31 and reinvesting proceeds into fixed-income investments and money market funds. The plan liquidation is permitted if State Street determines one (or both) of the following: "(A) there is a serious question concerning General Motors Corporation’s (“GM” or the “Company”) short–term viability as a going concern without resorting to bankruptcy proceedings; OR (B) there is no possibility in the short-term of recouping any substantial proceeds from the sale of stock in bankruptcy proceedings." Bank failures #26, 27, 28 and 29 for the year were American Southern Bank of Kennesaw, Georgia, Michigan Heritage Bank of Farmington Hills, First Bank of Beverly Hills and First Bank of Idaho of Ketchum, Idaho. The cost to the FDIC from the three failures will be $48.7, $50 million, $394 and $113 million, respectively. As the economy's green shoots are hyped by the chatterboxes on TV and the administration, in one week the FDIC's Deposit Insurance Fund has lost over $600 million on four bank bailouts. As the DIF only had $19 billion at December 31, Zero Hedge would wager there is little to no money left to insure systemic deposits, especially with bank neet need to use the TLPG any longer, thus depriving the FDIC of a much needed source of revenue. Additionally on the bank failure front, $1.6 billion Eastern Financial Florida Credit Union was placed in NCUA conservatorship. April 24, 2009, Alexandria, Va. -- The National Credit Union Administration (NCUA) today assumed control of the operations of Eastern Financial Florida Credit Union, a state-chartered, federally insured credit union headquartered in Miramar, Florida. Spreads were tighter in the US today as all the indices improved (and curves steepened with shorts getting squeezed at the mid to short-end). Indices typically underperformed single-names with skews mostly narrower as IG underperformed but narrowed the skew, HVOL outperformed but widened the skew, ExHVOL intrinsics beat and narrowed the skew, XO underperformed but compressed the skew, and HY outperformed but narrowed the skew. The names having the largest impact on IG are Macy's, Inc. (-47.5bps) pushing IG 0.36bps tighter, and CIT Group Inc (+127.41bps) adding 0.7bps to IG. HVOL is more sensitive with Macy's, Inc. pushing it 1.66bps tighter, and CIT Group Inc contributing 3.21bps to HVOL's change today. The less volatile ExHVOL's move today is driven by both Fortune Brands Inc. (-27.5bps) pushing the index 0.28bps tighter, and United Parcel Service Inc. (+4.5bps) adding 0.05bps to ExHVOL. The price of investment grade credit rose 0.22% to around 96.78% of par, while the price of high yield credits rose 1.6% to around 76.13% of par. ABX market prices are higher (improving) by 0.02% of par or in absolute terms, 0.07%. Broadly speaking, CMBX market prices are higher (improving) by 0.19% of par or in absolute terms, 0.49%. Volatility (VIX) is down -0.33pts to 37.37%, with 10Y TSY selling off (yield rising) 6.5bps to 2.99% and the 2s10s curve steepened by 4bps, as the cost of protection on US Treasuries rose 0bps to 45bps. 2Y swap spreads tightened 2bps to 60.75bps, as the TED Spread tightened by 1.7bps to 0.98% and Libor-OIS improved 1.8bps to 87.2bps. The Dollar weakened with DXY falling 0.87% to 84.769, Oil rising $1.72 to $51.34 (outperforming the dollar as the value of Oil (rebased to the value of gold) rose by 2.47% today (a 2.6% rise in the relative (dollar adjusted) value of a barrel of oil), and Gold increasing $8.75 to $913.05 as the S&P rallies (858.2 1.12%) outperforming IG credits (174.75bps 0.23%) while IG, which opened tighter at 180bps, underperforms HY credits. IG11 and XOver11 are -4bps and -21.01bps respectively while ITRX11 is -3.92bps to 150.5bps. The majority of credit curves steepened as the vol term structure flattened with VIX/VIXV rising implying a more bullish/less volatile short-term outlook (normally indicative of short-term spread compression expectations). Dispersion rose +5.7bps in IG (as differentiation remains a theme). Broad market dispersion is a little greater than historically expected given current spread levels, indicating more general discrimination among credits than on average over the past year, and dispersion increasing more than expected today indicating a less systemic and more idiosyncratic spread widening/tightening at the tails. 61% of IG credits are shifting by more than 3bps and 67% of the CDX universe are also shifting significantly (more than the 5 day average of 67%). The number of names wider than the index decreased by 3 to 44 as the day's range rose to 8.25bps (one-week average 8.68bps), between low bid at 173 and high offer at 181.25 and higher beta credits (-4.03%) outperformed lower beta credits (-2.99%). In IG, wideners were outpaced by tighteners by around 6-to-1, with only 14 credits wider at 5Y (although curves were steeper). By sector, CONS saw no names wider, ENRGs 25% names wider, FINLs 24% names wider, INDUs 18% names wider, and TMTs no names wider. Focusing on non-financials, Europe (ITRX Main exFINLS) underperformed US (IG12 exFINLs) with the former trading at 149.63bps and the latter at 143.29bps. Cross Market, we are seeing the HY-XOver spread compressing to 433.45bps from 480.35bps, and remains below the short-term average of 471.62bps, with the HY/XOver ratio falling to 1.52x, below its 5-day mean of 1.55x. The IG-Main spread compressed to 24.25bps from 25.58bps, but remains below the short-term average of 28.96bps, with the IG/Main ratio falling to 1.16x, below its 5-day mean of 1.19x. In the US, non-financials outperformed financials as IG ExFINLs are tighter by 6.7bps to 143.3bps, with 84 of the 104 names tighter. while among US Financials, the CDR Counterparty Risk Index fell 3.06bps to 225.25bps, with Finance names (worst) wider by 1.4bps to 1015.94bps, Banks (best) tighter by 10.36bps to 289.33bps, and Brokers tighter by 1.75bps to 280.83bps. Monolines are trading wider on average by 13.6bps (0.32%) to 2874.54bps. In IG, FINLs underperformed non-FINLs (0.44% tighter to 4.49% tighter respectively), with the former (IG FINLs) tighter by 2.1bps to 478.7bps, with 15 of the 21 names tighter. The IG CDS market (as per CDX) is 9.5bps cheap (we'd expect LQD to underperform TLH) to the LQD-TLH-implied valuation of investment grade credit (165.3bps), with the bond ETFs outperforming the IG CDS market by around 0.5bps. In Europe, ITRX Main ex-FINLs (outperforming FINLs) rallied 5.01bps to 149.63bps (with ITRX FINLs -trading sideways- weaker by 0.46 to 154bps) and is currently trading tight to its week's range at 21.66%, between 157.19 to 147.54bps, and is trending tighter. Main LoVOL (trend tighter) is currently trading in the middle of the week's range at 34.33%, between 112.76 to 104.83bps. ExHVOL underperformed LoVOL as the differential decompressed to -3.93bps from -5.57bps, but remains below the short-term average of -0.25bps. The Main exFINLS to IG ExHVOL differential compressed to 46.01bps from 48.92bps, but remains above the short-term average of 43.72bps. CDR LQD 50 NAIG091 -9.32bps to 229.99 (2 wider - 43 tighter <> 35 steeper - 14 flatter). CDX12 IG -5bps to 175 ($0.21 to $96.77) (FV -6.15bps to 194.6) (13 wider - 101 tighter <> 77 steeper - 47 flatter) - Trend Tighter. CDX12 HVOL -15.23bps to 400 (FV -14.77bps to 521.43) (2 wider - 28 tighter <> 25 steeper - 5 flatter) - Trend Tighter. CDX12 ExHVOL -1.77bps to 103.95 (FV -3.76bps to 106.71) (11 wider - 84 tighter <> 37 steeper - 58 flatter). CDX11 XO -12.3bps to 416.4 (FV -20.09bps to 474.73) (2 wider - 29 tighter <> 25 steeper - 9 flatter) - Trend Tighter. 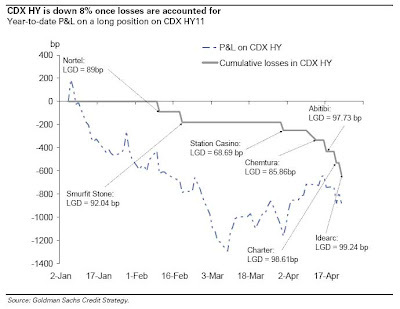 CDX12 HY (30% recovery) Px $+1.47 to $76 / -62.5bps to 1271.4 (FV -15.24bps to 1154.24) (16 wider - 77 tighter <> 74 steeper - 20 flatter) - Trend Tighter. LCDX12 (65% recovery) Px $+0.75 to $74.9 / +148.11bps to 1259.37 - Trend Wider. MCDX12 +0.13bps to 200bps. - No Trend. CDR Counterparty Risk Index fell 3.51bps (-1.54%) to 224.8bps (4 wider - 11 tighter). CDR Government Risk Index fell 0.18bps (-0.25%) to 73.14bps..
DXY weakened 0.87% to 84.77. Oil rose $1.72 to $51.34. Gold rose $8.75 to $913.05. VIX fell 0.33pts to 37.37%. 10Y US Treasury yields rose 6.7bps to 2.99%. S&P500 Futures gained 1.12% to 858.2. David Rosenberg punching the table on the little noticed fact that the Detroit production shutdown will have profound negative ripple effects on the economy. Zero Hedge still believes that fundmantals are more important to report than ongoing wholesale market short squeezes, so we present David Rosenberg's latest weekly observations. This financial crisis and deep recession has the economic outlook shifting so rapidly that the economic data flow, no matter how timely, is being rendered old news before it is even released. 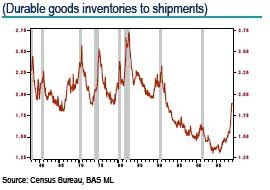 No piece of data exemplifies this more than today’s durable goods report for March. While it was far from a good report, the fact that orders ‘only’ fell by about half of what was expected fed the greenshooters’ case that we are starting to turn the corner. But this info is now stale news given GM’s tape bomb: a complete shutdown of production for the balance of the second quarter. What this means is the ISM could retest the 32.9 cycle low in May or June, even though the April ISM figure could well move higher when it is reported next Friday. In all, we are expecting vehicle production to be down 45% compared to last year, even factoring in Ford’s news that it would up production by 25%. The GM shutdown does not just mean more layoffs at their assembly plants; it will ripple across the parts industry as well. If parts manufacturers take similar production hits it could reduce motor vehicle payrolls by 140k. Chrysler has not released any new production intentions but with the specter of bankruptcy looming, could trim their 2Q production plans as well. If there was to be a month where home-buying activity was to turn up it should have been March, but instead both new and existing home sales dropped. Rates were an enticing and record low of 4.77% for a 30-year fixed mortgage, points and fees stayed low, and the stock market jump had pundits believing it was clear sailing from here on. However, these signs of thaw in credit conditions proved no match for the 5-million-plus jobs lost in the past year and counting, massive wealth destruction and the concern that residential real estate will not provide a decent investment return any time soon. Continuing unemployment claims jumped another 93k in the April 11 week and are up 570k since the mid-March survey week. Even with this record number of people on UI, the exhaustion rate (workers whose regular UI benefits have run out) rose to a record high of 45.6% in March. 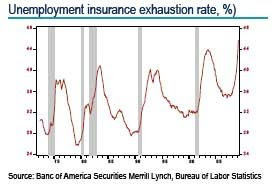 Come May 8th, the US economy will have the dubious honor of boasting a 9% unemployment rate, according to the tally of jobless claims so far in April. Another 670,000 nonfarm payroll losses are in store, which will bring the cumulative losses close to 6 million. We expect these types of major job cuts to continue for at least the next several months and the unemployment rate will attain a doubledigit handle by June or July. Though this is not a controversial call at this time, where we differ from consensus is our expectation of a sluggish pace of economic activity that will restrain job creation. Given that by our estimate the economy needs to create more than 100k jobs per month on a sustained basis to move the unemployment rate lower, we expect the unemployment rate will remain at a deflationary double digit level though to the end of 2010. The Fed has released the stress test methodology (link here). 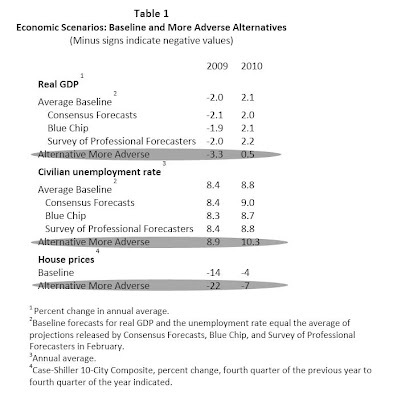 Note the amusing "More Adverse" projections. Also, a relevant statement from the Fed: “Losses associated with the deepening recession and financial market turmoil have substantially reduced the capital of some banks." Following up on the RBS GGP piece from earlier today, here are some even more specific insights, courtesy of Wachovia. Of particular note is the observation that SPE cash flows are subordinated to Bill Ackman's DIP. On April 17, the court issued an interim order authorizing the use of cash collateral at the SPEs and setting the adequate protection payments that will be paid to property lenders. Adequate protection payments are a court mandated payment for ongoing use of collateral. Based on this interim order, property lenders will be paid “non-default interest…to be paid when due.” This order is in effect until the final hearing date on the first day motions scheduled for May 8, at which time it may be extended. Each Adequate Protection Claim shall be accorded administrative expense priority in accordance with sections 503(b) and 507(b) of the Bankruptcy Code; provided, however, that the Adequate Protection Claims shall be junior to any superpriority claim granted to the Lenders and authorized by this Court in connection with any postpetition financing extended on account of such financing. Fitch, on April 21, moved 96 classes across 20 deals to negative outlook in response to GGP’s bankruptcy filing. Supporting the move, Fitch listed concerns that 1) the filing creates a level of uncertainty, 2) special servicers may be prohibited from foreclosing on properties, and 3) GGP may seek to add additional leverage against the properties. 1) Special servicing transfer: We believe properties listed in the filing will be transferred to special servicing. Along with this transfer, loans will incur a 25 bps-35 bps special servicing fee and a 1% cure fee. Along with this, we believe that properties will be subjected to updated appraisals. 2) As outlined above, we believe that investors should consider scenarios under which the hyper-amortization on ARD loans is interrupted. 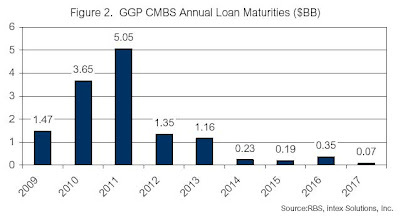 3) And, looking ahead, it may be helpful to begin considering extension scenarios of three to five years for GGP loans within CMBS, which have maturities in the next two years. Although it is admittedly early in the process, we believe it is reasonable to consider scenarios under which GGP uses the full 18-month period allotted to it to propose a plan of reorganization. This represents a starting point for considering possible extension scenarios, in our opinion. In thinking about the range of potential outcomes, it may be helpful to be aware of the possibility of lien stripping, although we believe this risk currently applies only to a minority of the loans. For an underwater loan, lien stripping involves reducing the secured claim to the value of the property and converting the remainder to an unsecured claim. Interesting to note is that the MACD for the recent rally has finally turned negative. Developing Story: Allegedly the "gradation release" will be "essential" for clarity on the stress tests. Things for the Treasury sure aren't looking pretty. With the 10 year about to break 3% outright, the 2s10s chart has just passed pre-Quantitative Easing levels. With Treasury supply really starting to ramp up, this could be a bad sign for agencies and mortgage rates. This happens as the TIPS auction is largely oversubscribed. Seems that the market is happy to jump over the next 2-3 years of deflation and is looking straight at 2013. Another interesting observation is that overnight Commercial Paper rates are spiking, in line with the most recent market top on April 17. With the bank stress tests wrapping up, sources tell The Post that regulators think they might have to make the bold move of removing Pandit to signal Washington is taking as hard a line with the banks as it did with General Motors when it effectively ousted GM CEO Rick Wagoner. Amid criticism that Citi hasn't moved fast enough to clean up its balance sheet and speculation that Citi may need to raise more cash amid rising writedowns from consumer debt, sources said there's a growing sense Pandit might have to be sacrificed. Such a move isn't without its own risks, though. In an interview with The Post, Citi CFO Ned Kelly said, "Replacing [Pandit] would be dramatically de-stabilizing both for Citi and the system." Replacing Pandit might be the pound of flesh some shareholders want, but it's possible such a move would do little to help the firm. Indeed, sources said possible successors like Kelly are loyal to Pandit, and others like Gary Crittenden, the new CEO of Citi Holdings, may not be willing to take on the role. Of course, one has to question the credibility of Post sources, however all signs are pointing to a growing antagonism between the administration and the two CEO, increasing seen as a symbol of the failed Wall Street of Q4, as opposed to the high flying Wall Street of Q1 (Q2 which will exclude December "write offs", unless somehow the banks pro forma all their losses in a February 29 hypothetical date which will hit the books in 2012, and will have much less one-off sources of taxpayer subsidized revenue will be yet another story). In other news, readers may want to line up in front of Citi HQ early next week, where the market's real bellweather, Geoffrey Raymond, will be collecting inspirational annotations for the completion of his latest masterpiece, the annotated Vikram (available for pre-sale). As everyone is claiming that that "big" funds are rushing to throw their money into the market, it is useful to see what the largest U.S. public pension fund manager did in Q1. 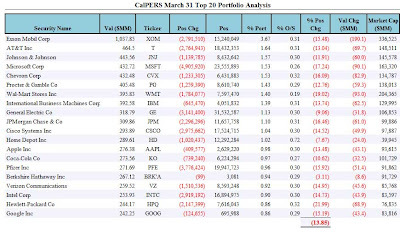 The result: in its top 20 positions, CalPERS sold out on average 13.85% of its holdings. Guess one would have to look elsewhere to find the source of all the "institutional" buying. 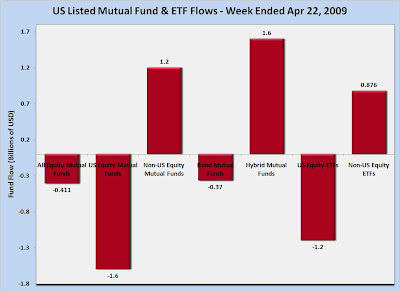 Looking at a more recent time frame, TrimTabs reports that the week ended April 22 saw a $411 million mutual fund outflow, reversing the revised inflow of $2.7 billion in the previous week. Equity funds that invest primarily in U.S. stocks posted an outflow of $1.6 billion, versus a revised inflow of $1.9 billion in the previous week. Equity funds that invest primarily in non-U.S. stocks had an inflow of $1.2 billion, versus a revised inflow of $808 million in the previous week. In addition, bond funds had an outflow of $370 million, versus a revised inflow of $5.5 billion in the previous week, and hybrid funds had an inflow of $1.6 billion, versus a revised inflow of $624 million in the previous week. Separately, TrimTabs reports that exchange-traded funds (ETFs) that invest in U.S. stocks posted an outflow of $1.2 billion, versus an outflow of $4.5 billion in the previous week. ETFs that invest in non-U.S. stocks had an inflow of $876 million, versus an inflow of $1.3 billion in the previous week. 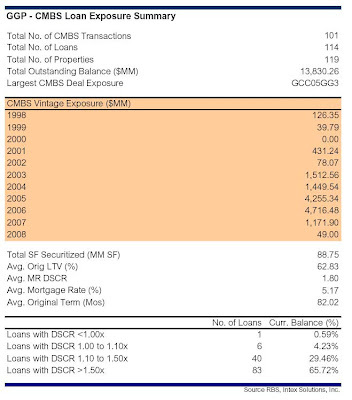 I previously disclosed GGP's extensive intertwined nature within the CMBS universe and considered some of the adverse CMBS implications as a result of bankruptcy remote SPEs being thrown into chapter 11 by GGP LP. The conclusion was that this "substantive consolidation" precedent bodes ill for the general stability of the CMBS market due to the reevaluation of this action's implications for "bankruptcy-remote" entities. In a research report by RBS released yesterday, the bank provides its thoughts on this troubling development. GGP LP is the entity through which substantially all of the GGP Group’s business is conducted. GGP LP owns or controls directly or indirectly GGPLP, LLC, The Rouse Company LP (TRCLP), and General Growth Management, Inc. (GGMI). GGP LP, GGPLP, LLC, and TRCLP are debtors in the Chapter 11 filing. Pertinent to the CMBS marketplace, 158 regional shopping centers owned by GGP subsidiaries filed, including some 75 single-purpose entities (SPEs) within CMBS transactions. According to the GGP website, 115 GGP related entities did not file for protection, including GGP's third-party management business conducted by General Growth Management, Inc. and GGP's joint venture malls and office properties. The CMBS SPE borrower filings could have significant ramifications for the CMBS marketplace. Most SPEs were structured as a single-member, single-purpose, single-asset entity with a general partner and an independent director (sometimes two directors), who must approve an SPE bankruptcy filing. In addition, lender’s legal counsel generally delivered a non-consolidation opinion in connection with the origination of these loans. The establishment of such bankruptcy-remote entities is designed to help keep a property from being consolidated with the bankruptcy of the parent company or legal owner; as such a consolidation could delay or impair the lender’s ability to collect on the outstanding loan. For example, a special servicer would need to seek the permission of the bankruptcy court in order to begin foreclosure proceedings. bankruptcy, all creditors. What is worrisome in the GGP situation is that it appears that all independent directors associated with the filing CMBS SPEs saw fit to approve the bankruptcy petition. We suspect that creditors will want to verify that all independent director and board approvals were sought and received by GGP. GGP has filed a motion that the Chapter 11 cases of SPE borrowers be consolidated for ‘procedural purposes only and jointly administered.’ If allowed by the NY bankruptcy court, such actions could represent a ‘substantive consolidation’ that allows GGP to pool the SPEs in with its unencumbered assets during the bankruptcy process. It remains to be seen whether or not the SPEs are allowed to remain in bankruptcy and, if they are, whether substantive consolidation with the parent occurs. The RBS report goes on to provide some useful fundamental data (remember when not everything traded with a beta of 1?) about GGP's portfolio. mall performance highlight the high quality of the company’s regional malls. Thus it is not the performance of the GGP assets that triggered the company’s bankruptcy filing, but rather its inability to refinance maturing secured and unsecured debt. GGP has approximately $18.4 billion in outstanding debt obligations that have matured or will mature by year-end 2012. Within the $18.4 billion, 68 loans, representing $9.9 billion in principal, are CMBS loans. In total, there are 114 securitized loans in 101 CMBS transactions with exposure to GGP/Rouse sponsored borrowing entities. 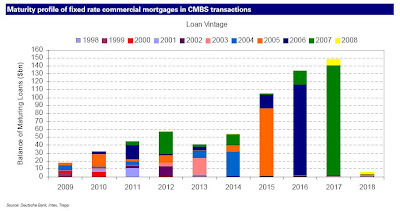 The outstanding balance on these CMBS loans is $13.8 billion, and the majority of the loans were originated in 2005 and 2006, post the Rouse acquisition. The average original LTV and most-recent DSCR on the 114 securitized loans are a strong 62.8% and 1.80x. The majority of the loans had original terms of five years, with the average original term of 82 months. What is most notable about these loans are the mortgage rates, which average just 5.2% with some as low as 3.38% and speaks to originator perception of both the quality of the assets securing the loan and the institutional REIT sponsorship. Daily Credit Market Summary: April 23 - Arbitrage? Spreads were tighter in the US today as all the indices improved. Indices typically underperformed single-names with skews mostly narrower as IG underperformed but narrowed the skew, HVOL underperformed but narrowed the skew, ExHVOL intrinsics beat and narrowed the skew, XO underperformed but compressed the skew, and HY outperformed but narrowed the skew. The names having the largest impact on IG are International Paper Co. (-50bps) pushing IG 0.37bps tighter, and CIT Group Inc (+115.49bps) adding 0.66bps to IG. HVOL is more sensitive with International Paper Co. pushing it 1.71bps tighter, and CIT Group Inc contributing 3.04bps to HVOL's change today. The less volatile ExHVOL's move today is driven by both Black & Decker Corporation (-32.75bps) pushing the index 0.34bps tighter, and Allstate Corp (+1.25bps) adding 0.01bps to ExHVOL. The price of investment grade credit rose 0.21% to around 96.53% of par, while the price of high yield credits rose 0.63% to around 74.63% of par. ABX market prices are higher (improving) by 0.07% of par or in absolute terms, 0.15%. Broadly speaking, CMBX market prices are higher (improving) by 0.15% of par or in absolute terms, 0.39%. Volatility (VIX) is down -0.95pts to 37.22%, with 10Y TSY rallying (yield falling) 1.6bps to 2.93% and the 2s10s curve steepened by 1.7bps, as the cost of protection on US Treasuries fell 1.76bps to 45bps. 2Y swap spreads tightened 1bps to 62.5bps, as the TED Spread widened by 3.2bps to 1% and Libor-OIS improved 1.3bps to 88.5bps. The Dollar weakened with DXY falling 0.78% to 85.517, Oil rising $0.55 to $49.4 (outperforming the dollar as the value of Oil (rebased to the value of gold) fell by 0.26% today (a 0.35% rise in the relative (dollar adjusted) value of a barrel of oil), and Gold increasing $12.4 to $902.15 as the S&P rallies (848.4 1.37%) outperforming IG credits (180.75bps 0.22%) while IG, which opened tighter at 185.5bps, underperforms HY credits. IG11 and XOver11 are -4.5bps and -9.58bps respectively while ITRX11 is -0.43bps to 154.5bps. Dispersion rose +2.6bps in IG. Broad market dispersion is a little greater than historically expected given current spread levels, indicating more general discrimination among credits than on average over the past year, and dispersion increasing more than expected today indicating a less systemic and more idiosyncratic spread widening/tightening at the tails. 60% of IG credits are shifting by more than 3bps and 63% of the CDX universe are also shifting significantly (less than the 5 day average of 66%). The number of names wider than the index decreased by 1 to 47 as the day's range fell to 6.88bps (one-week average 8.63bps), between low bid at 179.5 and high offer at 186.375 and higher beta credits (-4.33%) outperformed lower beta credits (-3.42%). In IG, wideners were outpaced by tighteners by around 6-to-1, with 10 credits wider. By sector, CONS saw 5% names wider, ENRGs 13% names wider, FINLs 24% names wider, INDUs 0% names wider, and TMTs 4% names wider. Focusing on non-financials, Europe (ITRX Main exFINLS) underperformed US (IG12 exFINLs) with the former trading at 154.75bps and the latter at 149.7bps. Cross Market, we are seeing the HY-XOver spread compressing to 476.02bps from 493.9bps, but remains above the short-term average of 474.3bps, with the HY/XOver ratio falling to 1.56x, below its 5-day mean of 1.56x. The IG-Main spread compressed to 26.25bps from 30.82bps, and remains below the short-term average of 29.3bps, with the IG/Main ratio falling to 1.17x, below its 5-day mean of 1.19x. In the US, non-financials outperformed financials as IG ExFINLs are tighter by 7.6bps to 149.7bps, with 94 of the 104 names tighter. while among US Financials, the CDR Counterparty Risk Index fell 8.82bps to 228.31bps, with Brokers (worst) tighter by 6.25bps to 280.83bps, Banks (best) tighter by 15.71bps to 301.65bps, and Finance names tighter by 17.34bps to 1003.71bps. Monolines are trading wider on average by 118.79bps (3.31%) to 2926.7bps. In IG, FINLs underperformed non-FINLs (0.62% tighter to 4.83% tighter respectively), with the former (IG FINLs) tighter by 3bps to 483.4bps, with 11 of the 21 names tighter. The IG CDS market (as per CDX) is 9.7bps cheap (we'd expect LQD to underperform TLH) to the LQD-TLH-implied valuation of investment grade credit (171.05bps), with the bond ETFs underperforming the IG CDS market by around 6.98bps. In Europe, ITRX Main ex-FINLs (underperforming FINLs) rallied 0.1bps to 154.75bps (with ITRX FINLs -trading sideways- better by 1.74 to 153.5bps) and is currently trading in the middle of the week's range at 74.72%, between 157.19 to 147.54bps, and is trending wider. Main LoVOL (trend wider) is currently trading at the wides of the week's range at 85.09%, between 112.76 to 104.66bps. ExHVOL outperformed LoVOL as the differential compressed to -3.2bps from 2.18bps, and remains below the short-term average of -0.62bps. The Main exFINLS to IG ExHVOL differential decompressed to 46.39bps from 43.07bps, and remains above the short-term average of 44.37bps. CDR LQD 50 NAIG091 -11.2bps to 238.54 (4 wider - 46 tighter <> 32 steeper - 18 flatter). CDX12 IG -5.5bps to 180.25 ($0.23 to $96.55) (FV -7.02bps to 200.77) (10 wider - 105 tighter <> 80 steeper - 45 flatter) - No Trend. CDX12 HVOL -10bps to 410 (FV -15.57bps to 536.92) (4 wider - 24 tighter <> 17 steeper - 12 flatter) - No Trend. CDX12 ExHVOL -4.08bps to 107.7 (FV -4.67bps to 110.35) (6 wider - 89 tighter <> 29 steeper - 66 flatter). CDX11 XO -14.4bps to 429.3 (FV -20.46bps to 485.41) (4 wider - 28 tighter <> 21 steeper - 13 flatter) - Trend Wider. CDX12 HY (30% recovery) Px $+0.63 to $74.63 / -27.5bps to 1328.5 (FV -26.17bps to 1176.9) (21 wider - 68 tighter <> 62 steeper - 30 flatter) - Trend Wider. LCDX12 (65% recovery) Px $+0.51 to $74.35 / +181.01bps to 1313.64 - Trend Wider. MCDX12 0bps to 199.75bps. - Trend Wider. CDR Counterparty Risk Index fell 8.5bps (-3.59%) to 228.63bps (1 wider - 14 tighter). CDR Government Risk Index fell 0.18bps (-0.25%) to 73.29bps. DXY weakened 0.78% to 85.52. Oil rose $0.55 to $49.4. Gold rose $12.4 to $902.15. VIX fell 0.95pts to 37.22%. 10Y US Treasury yields fell 1.6bps to 2.93%. Developing story out of the NYT. The Treasury Department is preparing a Chapter 11 bankruptcy filing for Chrysler that could come as soon as next week, people with direct knowledge of the action said Thursday. Officials at Chrysler and the Treasury were not immediately available for comment. A bankruptcy filing by Chrysler would be the first among Detroit’s troubled automakers, who have been mired in a devastating sales slump since last fall. Treasury is also working with General Motors to prepare a possible bankruptcy case, and the terms of a Chrysler filing might offer a glimpse into the shape of G.M.’s own filing. Nothing like using Chrysler with its millions of worker as leverage in negotiations with GM's bondholders. Too bad there is no Chrysler public stock that can be short squeezed to oblivion. Update: Dow Jones up 90 points on the news in 5 minutes. Nothing like purchasing a major investment bank on the verge of bankruptcy with no due diligence (actually Ken Lewis would beg to differ). The Fed has reported a loss of 28% on its commercial mortgage loans and 38% on residential mortgage loans as a result of its participation in Maiden Lane, the Bear Stearns bail out vehicle. It is curious if these are comparable loans to the ones that Citi still has provisioned at 95 cents on the dollar on its balance sheet. Of course an incremental 23% loss provision on Citi's massive CRE book would immediately destroy any excess/Tier 1/tangible/"what have you" capital the bank pretends to have. But then again this is merely and apples to apples comparison. As every sane person knows nothing rational in this market/country at this point makes any sense. S&P is out with a report which basically says car scrappage will be the new black... At least for autos. From a report just released, S&P sees a 13.6 million SAAR... in 2011! NEW YORK (Standard & Poor's) April 23, 2009--The economic outlook for the makers, parts suppliers, sellers, and financiers of cars will remain bleak at least until 2010, according to Standard & Poor's Ratings Services in a series of reports published this week on RatingsDirect. "We expect only a slow recovery in light-vehicle sales, to 11.2 million units in 2010 and 13.6 million in 2011," said David Wyss, Chief Economist at Standard & Poor's, in "Why A U.S. Auto Recovery Will Be Stuck In The Slow Lane," published April 20, 2009. "After car sales plunged last year, we expect only 9.7 million units to be sold this year," he continued. 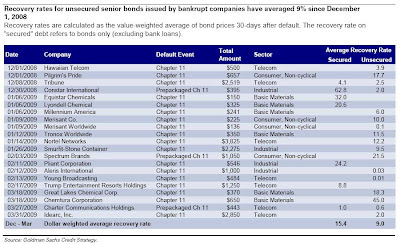 In addition, our recovery estimates of how much we think lenders could recover in the event of a default or bankruptcy are lower for companies in this sector than those for the U.S. corporate sector as a whole, according to "What Recovery Ratings Are Saying About The U.S. Auto Sector," also published yesterday. The articles are part of a special report on the worldwide auto and truck maker industries on RatingsDirect, and they will appear in the April 29 issue of CreditWeek, Standard & Poor's weekly magazine. In the special report, Standard & Poor's analysts in the U.S., Europe, and Asia discuss the key challenges facing the global car, truck, and related industries. "Seems like Ken Lewis has changed his story. Previously Mr. Lewis has stated unambiguously that Bank of America was not aware of the losses at Merrill Lynch until after the Dec. 5 shareholder vote. Now he states differently. I think this will certainly strengthen our lawsuit." Well, this just gets deeper and deeper. Before we proceed with the rest of the article, it's important to note that there currently isn't really a significant amount of room for copper to fall. However, as we dig through the details an inconsistent picture emerges. As we mentioned in our first article on the subject, we discussed an uneasy feeling that demand was sure to fall in aggregate and copper prices did not seem to have that priced in. 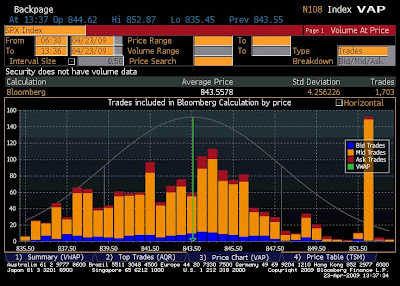 Supporting that view, BarCap reports that the mood at CESCO 2009 was relatively skeptical on the direction of the market and many were questioning if the market was reflecting the fundamentals. The consensus expectations were predicting a roughly 10% drop in demand with some going as high as 13.5%. As we would expect, most of this is coming from developed/industrialized countries. Put another way - in 2006, the ratio of OECD:China:ROW Cu demand was in roughly a 2:1:1 ratio. By 2009, this ratio is closer to 1.2:1.1:1.0, with overall demand numbers largely unchanged. Of course, no surprise here. 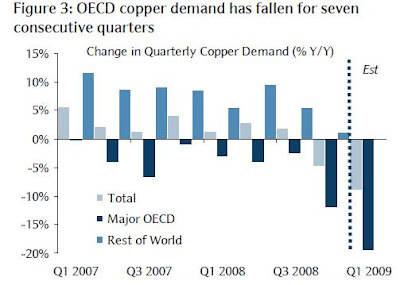 However, with OECD plummeting and no real respite in sight for their economies and ROW being relatively stable - the question on demand becomes how much can we rely on China to keep importing huge amounts of copper. Through our research, four major reasons have emerged to sell the story on why China is importing so much copper in the context of a global economic contagion. None of them are convincing. First, I have yet to figure out a convincing reason why a hyper-conservative investing entity would move from Treasury bills to copper as a store of value - the same copper that has fallen almost 3x peak to trough. There is a valid argument that China has a long-term investment horizon but it has repeatedly shown that it likes to act like a drawdown-shy pension fund. Diversifying for China would be buying other government bonds, not buying pseudo-strategic resources for its industrial complex. As for the second reason attributed to this cause, if true, it seems an unsustainable demand driver. Once China has filled up the tank and goes away satisfied, what then? There is also a minor quibble that if it were true, one would think China would be a little more subtle about it's buying and play the market structure a bit better - though the sheer volume hinders that to some degree. As we have discussed in our last post why we severely doubt the veracity of China's numbers, we won't rehash. However, I don't think we are the only ones to doubt the methodology, political agenda, and reliability of their numbers - a quick Google search will show a number of other luminaries who are highly skeptical. Additionally, we have gotten anecdotal reports that the mood on the ground in China is much less sunny than what we are hearing from the official releases. When the Chinese middle class expands and the currency finally floats, it may be a more sellable story - but until then, it's tough to swallow. 3. Chinese scrap is getting harder to find/salvage/produce/refine, etc. Simply put, if this is true, we can't think of a situation where this doesn't end in tears. The spread admittedly is ridiculously high but given the market barriers, it's unlikely to be the primary driver of aggregate Chinese demand, especially since the Chinese government isn't naturally a market arb player. In summary, we have to seriously question the fundamentals of the rally in copper. Many of the reasons being tossed around seem unsubstantive and/or unsustainable. However, there may be market forces going around that aren't being discussed and it would be really interesting to get more color on those.